This week’s edges are also simple and easy ones. The free graph for these edges are here. I seem to have started this challenge in a hurry. The details were not read properly, totally did not see where they had mentioned that the design is not symmetric. The result- tried and failed to work mirror image of one side, in haste missed a whole row, ended with wrongly worked asymmetric medallion! The edges challenge start from today. The graph pattern for these edges are available on this blog. The first edge is similar to Greek pattern, earlier for a border design I had converted a Greek border into kutch work. The second edge in straight stitches is common in kasuti embroidery from India, where the stitches are double running stitch and the knots are tucked in so neatly that there is no difference between the right and wrong side. The working of this stitch and its beaded version are on Pintangle. I worked this stitch sampler in polyester threads. They did not behave very well with thread tension, so I have wobbly or very tight stitches which do not look pretty. I started this sampler by working a few rows of straight stitches. The first few rows worked with knotted buttonhole band. These are the results of the combination of learning the stitch, maintaining the thread tension and the crazy thread itself. These knots turn around in all directions! After working on the angled straight stitches, two straight stitches were worked together with this stitch instead of one at a time in the second row. Two rows of knotted buttonhole bands worked together in the next two samples. 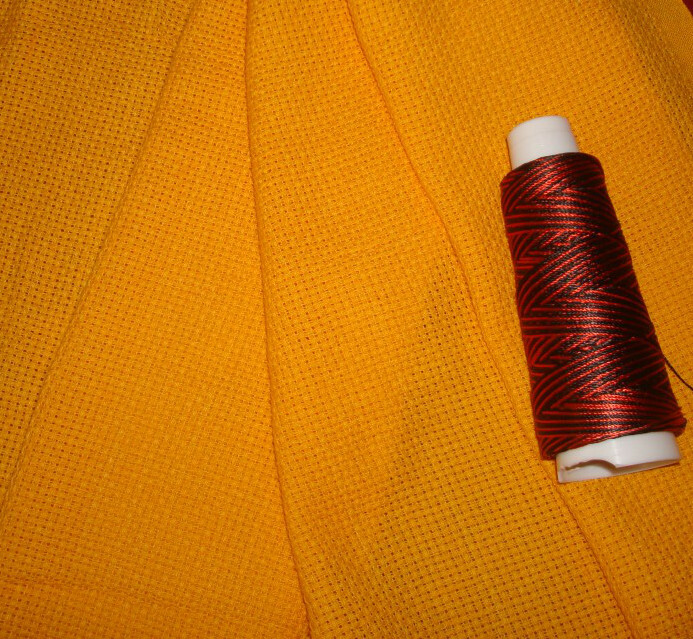 The stitch worked in a curve in the fifth sample. 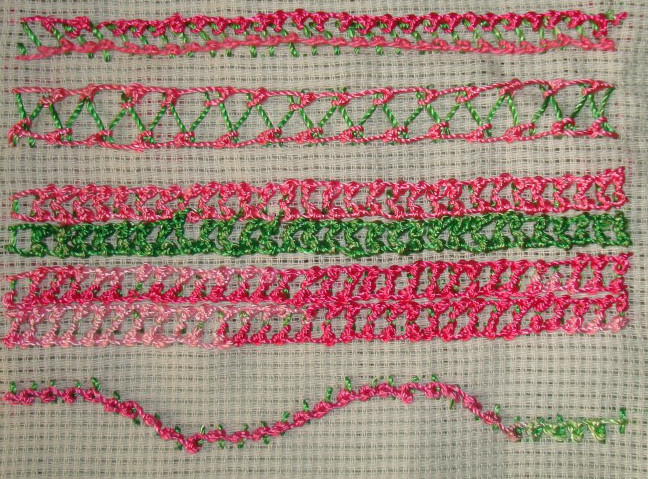 The stitch is laced with pink thread in the first sample, the stitch is worked over straight stitches of varying heights in the second sample, the zigzag version was tried in the third sample. I like this one. With these samples this stitch sampler was completed. This stitch would have looked better if they were worked with # 5 perle cotton. In the zigzag version the thread was kept left and right alternatively. I feel the zigzag version adds a decorative and textured effect to plain stitches. Though itching to try more, I do have to catch up on other stitches. 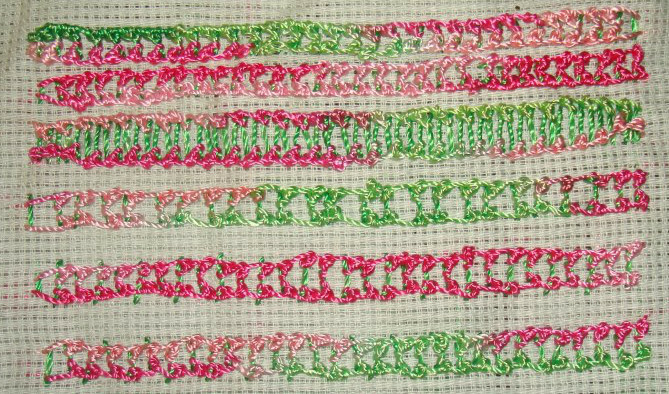 After exploring this fern stitch with few more samples the stitch sampler was completed. 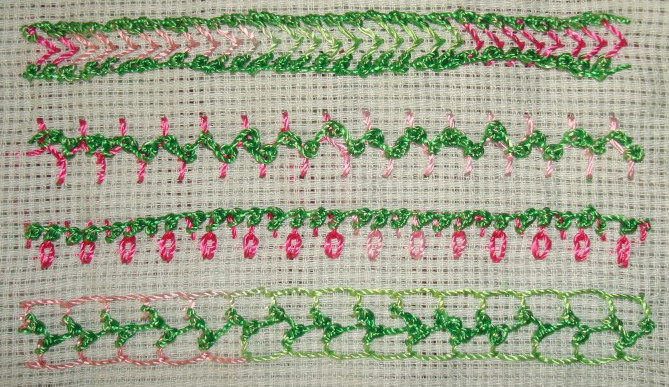 3.Starting with two more samples of fern stitch rows worked together, the fern stitch is whipped in the third sample, and laced in the fourth sample. 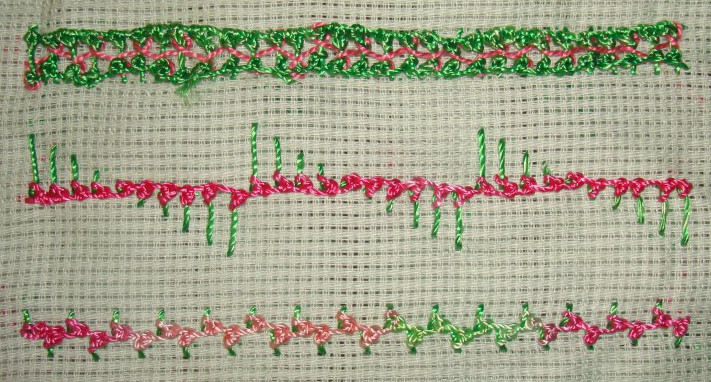 The pink thread is laced through individual fern stitches in the fifth sample. 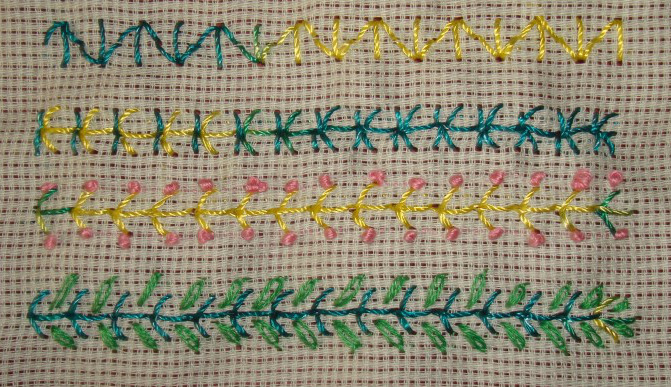 4.In these samples the fern stitches are worked diagonally. The last two samples would be good as filling stitches. 5.The first sample has individual fern stitch and its inverted version worked alternatively. 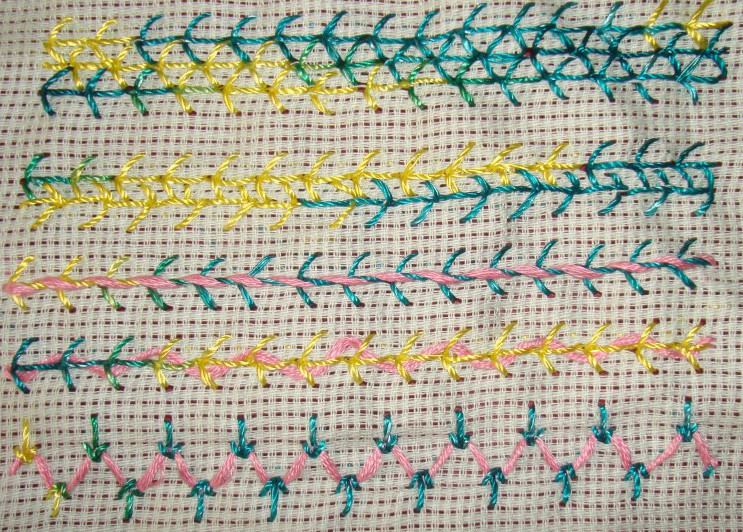 Two extra straight stitches are added in the second sample. French knots and detached chain stitches are worked along with fern stitch in the last two samples. This is an easy and versatile stitch to work with. Similar to fly stitch. I enjoyed working on this sampler. 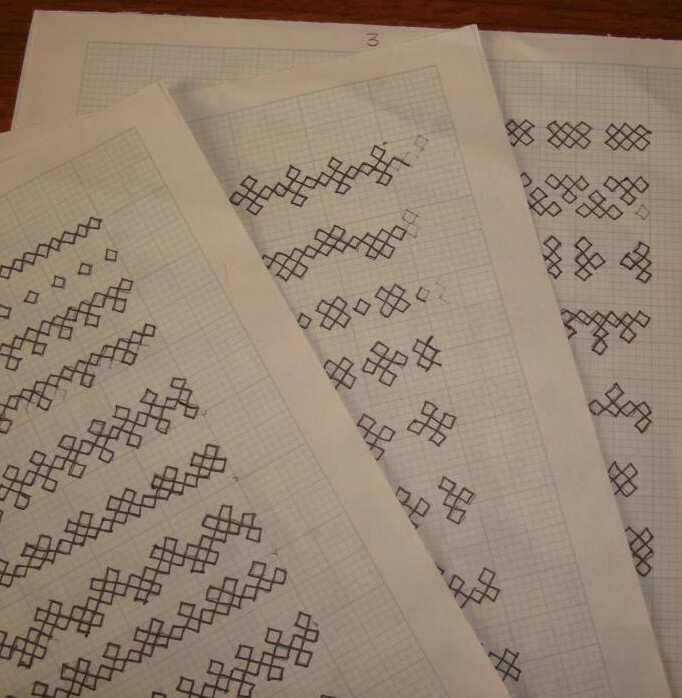 Band sampler is easier for exploring new stitches. I have not been working on TAST challenge stitches for the past few weeks. This week’s stitch is fern stitch, the working of which is on SharonB’s pintangle. 1. Started with the basic fern stitch in the first sample, the side straight stitches are too vertical in this sample. the second sample is better, the side straight stitches are long and short alternatively in the third sample. 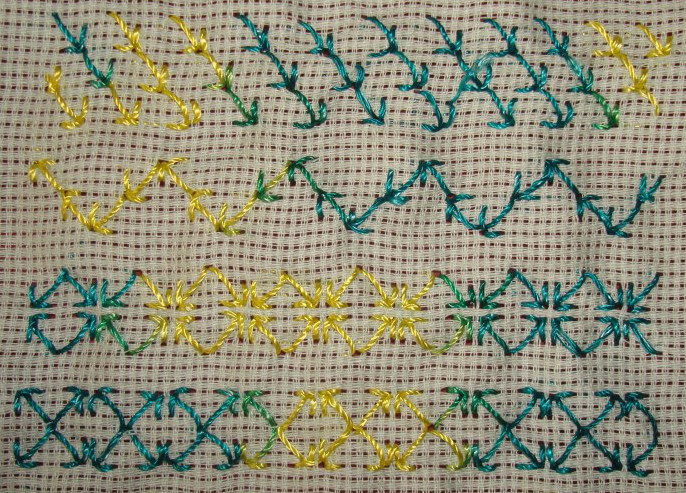 the straight stitches on the top are shorter than the ones at the bottom in the fourth sample. 2.The fern stitches are close and farther alternatively in the first sample. The fern stitches are worked very close in the second sample. 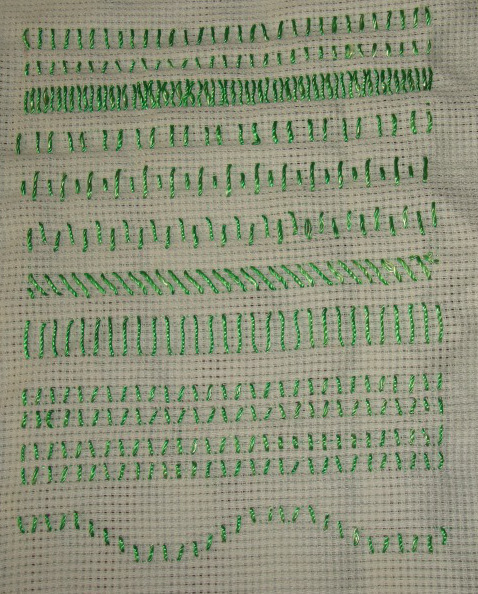 Four rows of fern stitches form the third sample. 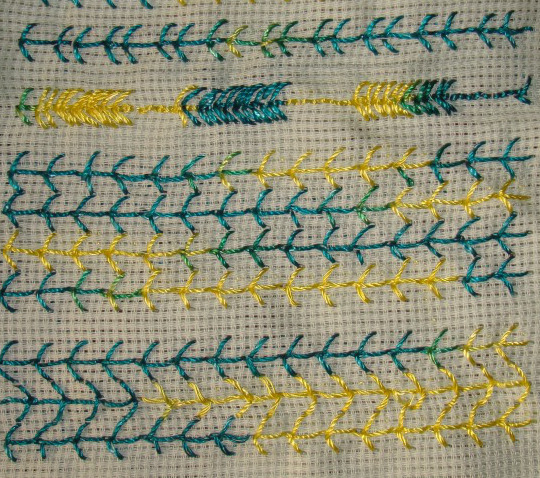 Three rows of fern stitches worked facing each other in the fifth sample.